Long in the forefront of delivering innovative and quality instruction in Chemistry, the UM Chemistry Department pairs CSIE-UM participants (postdoctoral associates, graduate and undergraduate students) with faculty members working on revamping the curriculum, reworking laboratory instruction, exploring new approaches and technologies in pedagogy, and more. History & Development of CSIE|UM Change 2016 (Mar/Apr) 48:2 pp. 34-43. October 2015: CSIE|UM shortlisted for 2015 “Reimagine Education” award. There is an opportunity for a graduate student to spend 8-10 weeks over the summer as a visiting graduate student in Prof. Carolyn Anderson’s group at Calvin College. This would be of interest to a student who is interested in learning what it is like to be a PI at a PUI, to spend time both conducting research and supervising undergraduates in a PUI environment. This program will provide funding for the student’s stipend for 8-10 weeks along with housing at Calvin. Because the student will be here in Ann Arbor for roughly 1/2 of the Spring/Summer terms, they will need to be covered as a 25% GSRA by their UM advisor. As part of the application, the student will need to obtain a letter of recommendation from their faculty advisor that also affirm’s the advisor is OK with the graduate student spending 8-10 weeks at Calvin. The length and dates are negotiable (although their academic year does not end until May 20th, so the 8-10 week period of time will most likely need to fall in the late-May to late-August time window. 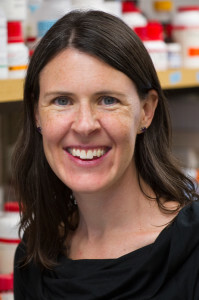 Prof. Anderson is an organic chemist, and her research is centered on the synthesis of heterocycles (mainly N-alkyl pyridones), so this may be primarily of interest to students working in areas of synthetic chemistry. 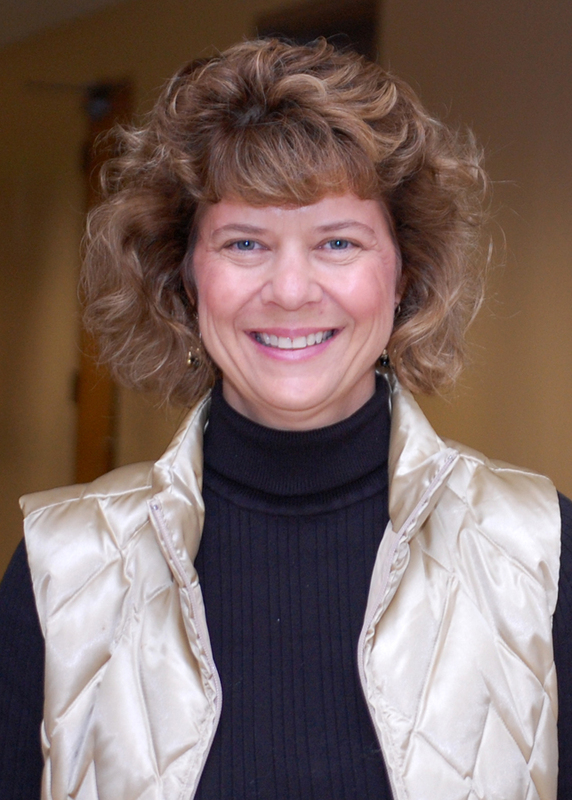 Here is a link to her faculty webpage. A short flyer with a little additional information can be found here. On April 6th, CSIEUM hosted a FFGSI Update event to give 30 attendees an idea about the types of projects FFGSIs participate in. 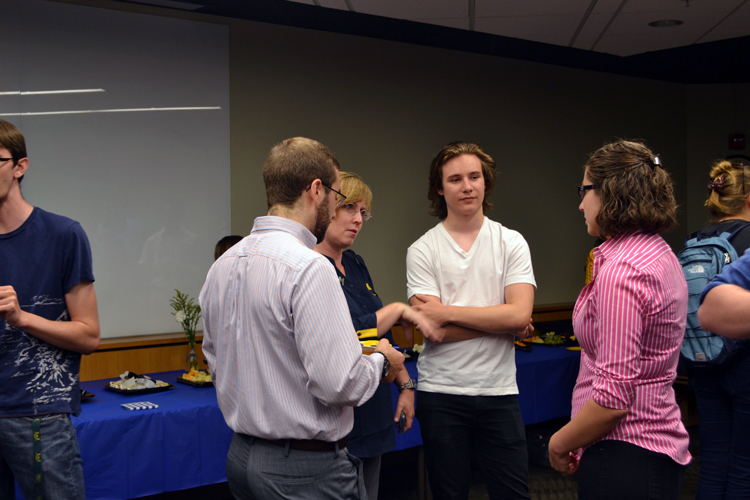 During the program, attendees heard about three projects featured thermodynamics, organic chemistry, and coding. 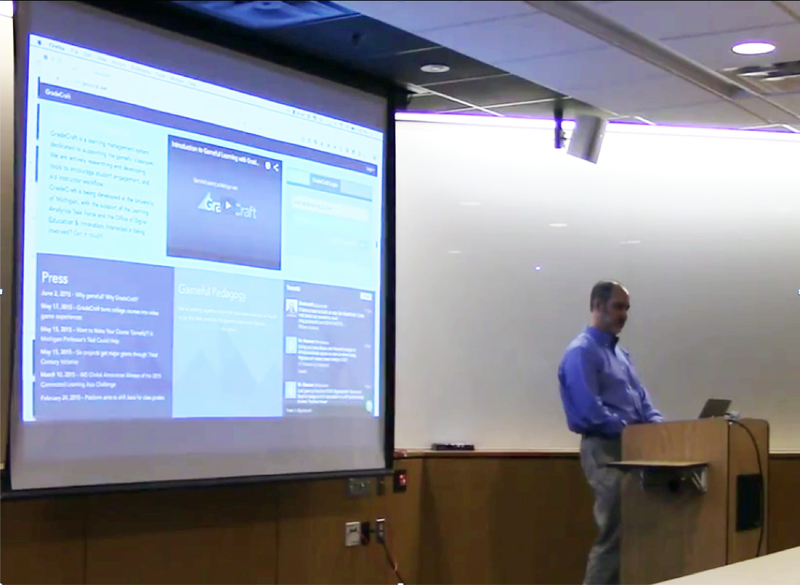 CSIE|UM hosted Professor Jeff Moore from the University of Illinois to discuss his work on designing a new organic chemistry course with significant online components, including grading. Professor Sam Pazicni (UNH) led an interesting and provocative CSIE|UM discussion, in which he developed the idea that one’s basic laboratory research training is a proper foundation for transferring skills over to educational development and research. For more of this report, see here. A group of 6 graduate students visited Oberlin College to get a broader appreciation of different institutional types. For a report on this visit, see here. Artistic wizard and chemistry graduate student Run Wiscons led a three-part workshop for other graduate students on learning the fundamentals of using Adobe Illustrator for scientific illustration. For a report on these, see here. 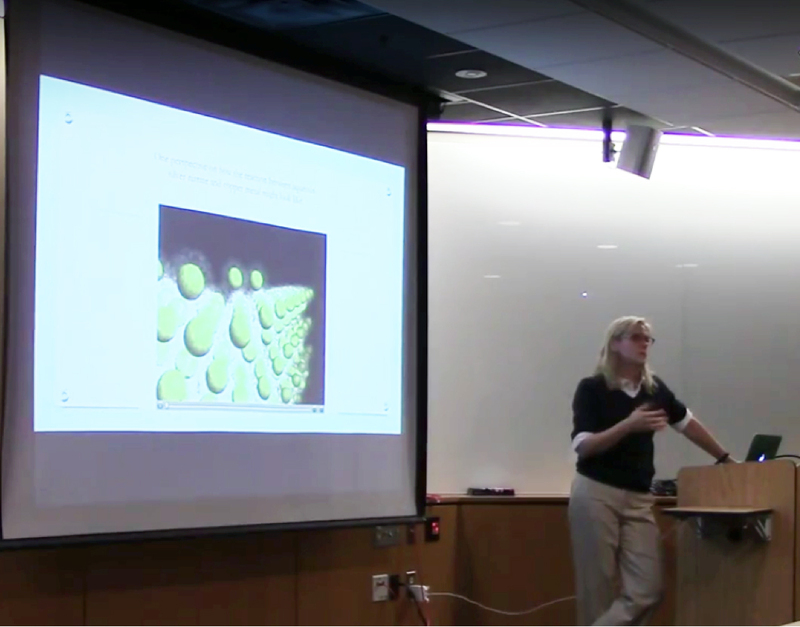 On Friday, Nov. 17th, CSIE|UM hosted Dr. Mary Kirchhoff, from the American Chemical Society, where she currently serves as the Executive Vice President for Scientific Advancement and the Director of the ACS Green Chemistry Institute. Dr. Kirchhoff also served as the Director of the ACS Education Division for 11 years previously. On October 13th, Professor Jeff Raker, a chemistry education professor at the University of South Florida, gave a seminar as part of CSIE|UM covering his work aimed at investigating the relationship between student affect with achievement and retention in STEM. Former U-M President Mary Sue Coleman is currently the President of the American Association of Universities (AAU). She is serving on a study team, organized by the National Academies, on “Revitalizing Graduate STEM Education.” This is at least the third large effort to take a look at graduate education in the last decade or so (The Woodrow Wilson Foundation and The Carnegie Foundation both had large, national programs). 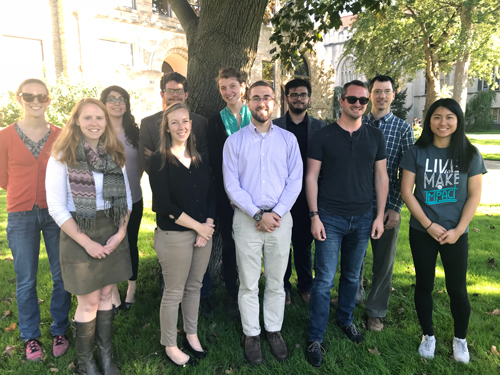 The Study Director, Layne Scherer (a U-M grad) made a 2-day site visit (October 5-6, 2017) to meet with students and faculty members about the graduate program. The schedule for the day (and links to outcomes, as they might happen) are located here. 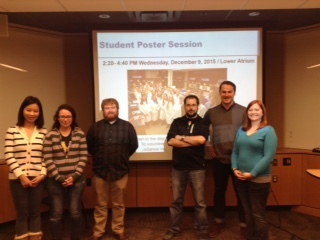 A group of 13 graduate students spent a day visiting with the faculty members at Hope College in Holland, MI. 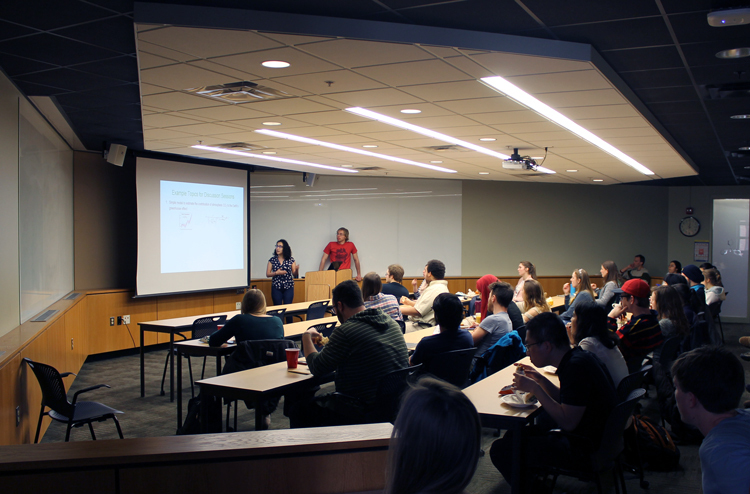 Sessions were held with (1) Brand New Faculty, (2) Undergraduates, and (3) Tenured Faculty. The group also toured the school and sat in on a few classes. The full report appears here. 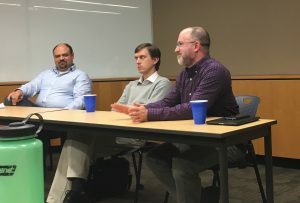 CSIE|UM invited six UM Chemistry professors (2 from each level of professorship) to provide perspective and share their own philosophies and practices on managing their labs in a pair of town-hall style discussions. This panel focused on topics including: designing an educative environment, writing of reference letters, and recruiting, retaining, and graduating lab members. This panel focused on topics including:: motivation, conflict resolution, effective communication strategies, and research collaborations. 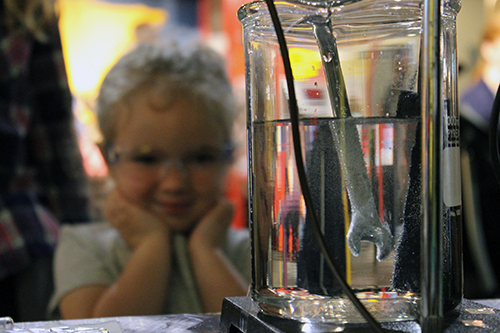 The Ann Arbor Hands on Museum, a local interactive children museum, hosted a group of University of Michigan Chemistry Department PhD students and postdoctoral associates to showcase recently developed activities and demos. The activities and demos were developed as a collaboration between CSIE|UM and the Hands on Museum to feature research being conducted in the UM Chemistry Department. This event was the last event in a four part series called ‘Science for the Public’ promoting understanding of science research to the general public. Link a report from the Ruotolo lab. Link to a report from the Pratt lab. The second part of the “translating research” series was held on Friday, February 24, 2017. Nicole Wright from the Hands-on Museum lead a workshop on how to think about and prepare an activity for the public. Part of this workshop was devoted to brainstorming activity ideas in groups. These events focus on translating your lab’s research into an outreach activity. The activities will be designed in groups with guidance from the Ann Arbor Hands-on Museum. The final event of this series is to perform your activity on the floor of the Ann Arbor Hands-on Museum! Originally from Peru in South America, Karin is appointed as an assistant professor in the department of chemistry in University of Central Florida. 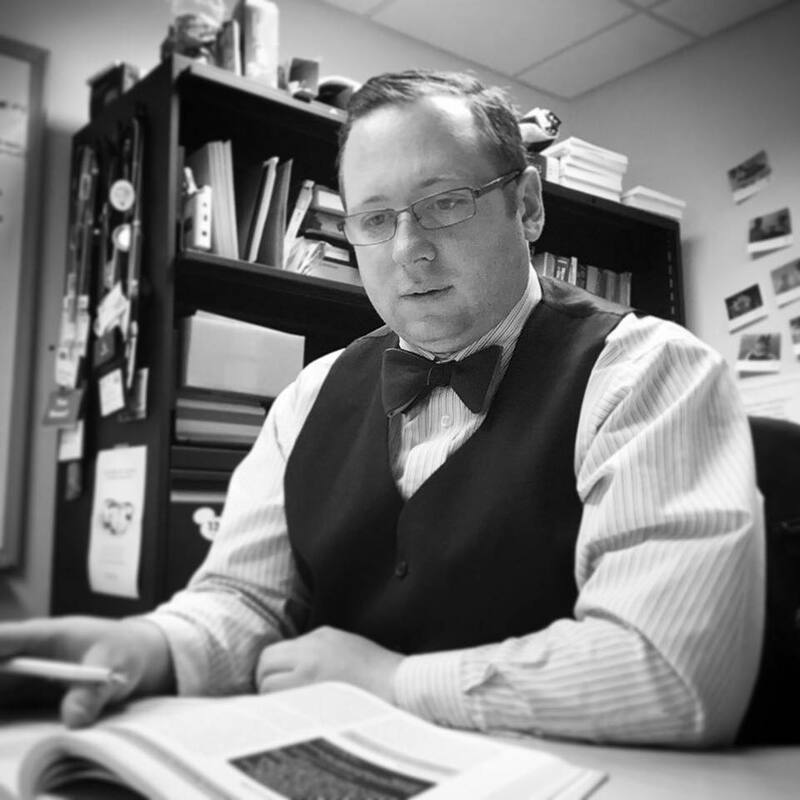 Dan Fabris ventured into the academics career in the United States coming from Italy. 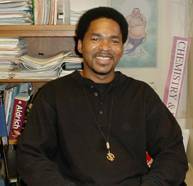 He is currently a professor of chemistry and biological sciences at the State University of New York in Albany. 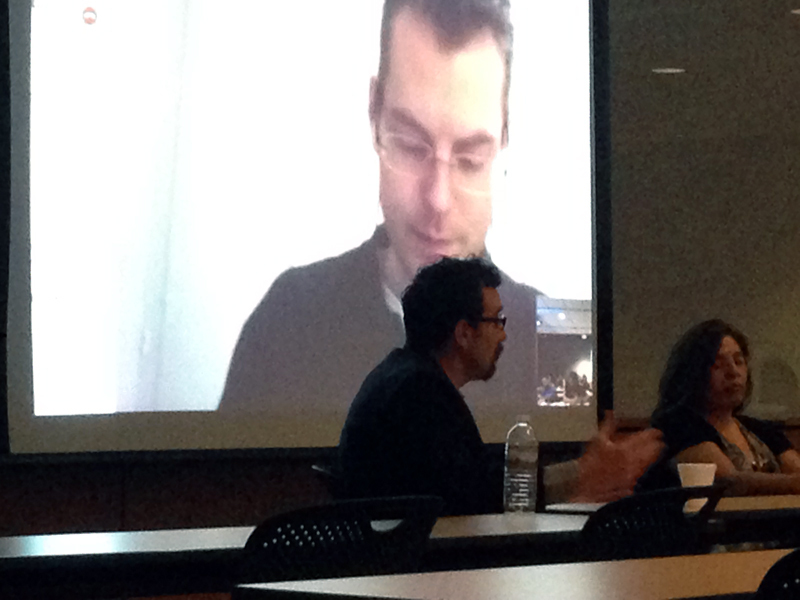 Our last panelist, Simon Duttwyler, joined us via Skype from Switzerland, which is his hometown. He is currently a professor of chemistry at Zhejiang University in China. Microagressions are everyday verbal or nonverbal environmental slights, snubs and insults that, more often than not, are subconsciously committed by individuals with a privileged, and/or dominant culture background. Elizabeth Rohr, Program Coordinator with the University’s Barger Leadership Institute facilitated a group discussion, as well as small group activities, that focused on identifying and addressing the role and impact that microaggressions have in and on our daily lives and beyond. A seminar and discussion on”Chemistry Education in Africa” was given by Samuel Mawolo Johnson. Samuel is a visiting scholar of the U-M African Presidential Scholars (UMAPS) program in collaboration with Prof. Brian Coppola, Prof. Bart Bartlett, Dr. Alex Poniatowski, and Samuel Earey on developing chemistry laboratory experiments to take back to his home university at the University of Liberia, which has been gutted and left in poor conditions after the recent civil war. 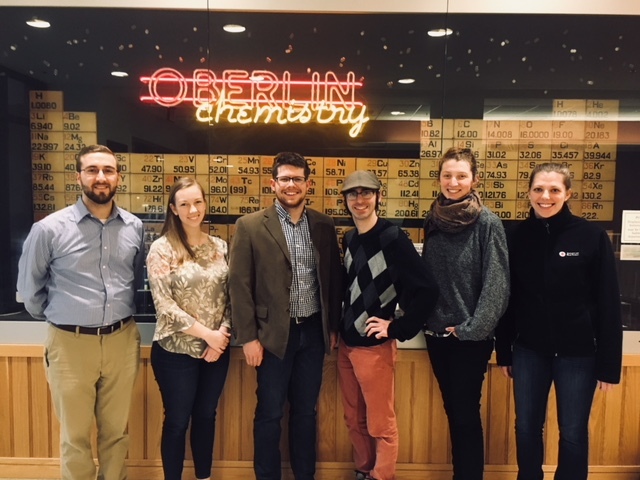 On Saturday, January 21st, a group of 12 University of Michigan chemistry graduate students from 11 different research groups participated in an afternoon event at the Ann Arbor Hands On Museum. This is the first of 3-4 sessions where students will transform their research ideas and results into a form that is accessible for the general public, and particularly for children. Dr. Mary Starr, the executive director of the Michigan Math and Science Centers, led a discussion about the deep needs for engagement with K-5 teachers, the general outline of the Next Generation Standards and how they are represented in Michigan. 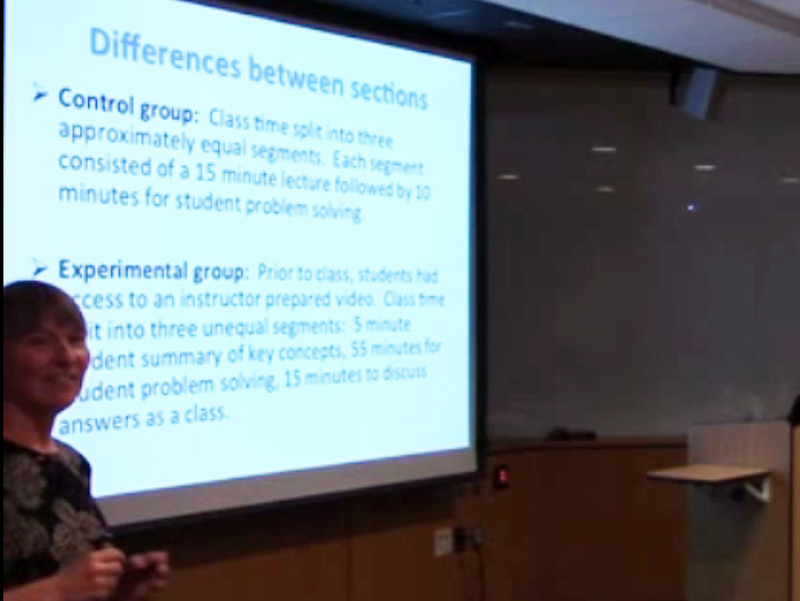 After a hands-on activity with pendular motion, Dr. Starr outlined the standard, multi-session program in which students and teachers could interact, which can also be hosted at U-M. The report for this event is here. 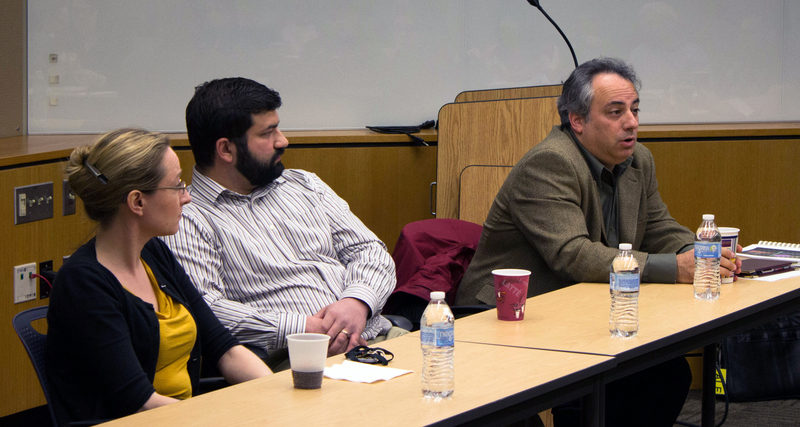 The panel on Early Career experiences featured three faculty members from a range of institutions who were in similar positions in their tenure track. Our guests were Prof. Charles McCrory from the University of Michigan (2nd year), Prof. Oleksandr Kokhan from James Madison University (3rd year), and Prof. Cory Emal from Eastern Michigan University (6th year). 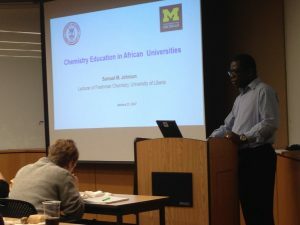 Approximately 40 University of Michigan graduate students and post-docs were in attendance. Detailed Report from the 2016 Symposium is located here. The faculty perspective on the laboratory has been investigated via a mixed methods study to articulate the goals, strategies, and assessments used in undergraduate teaching laboratories. Additionally, we have investigated the student perspective of laboratory with the goal of comparing it to the faculty perspective and improving instruction. Results of our research about the goals of majors and non-majors will be discussed as well as initial forays into improving laboratory instruction. Register to participate in a hands-on workshop. If you are registering to present a poster over the dessert hour, please be prepared to submit a poster title and list of author names when you register. Poster boards (4×4 feet) and easels will be available for displaying your work. In six concurrent break-out sessions, participants will discuss topics related to the themes of the day. Each discussion will be in a different room and will have a local host and notetaker. The notes will be the basis for sharing the discussion during the plenary reporting out. The break-out groups will reconvene and report back to all in attendance about their discussion: key ideas, emergent questions, potential solutions, good models, etc. Traditional introductory organic chemistry laboratory courses involve students following a ‘recipe’ to synthesize a particular product. While such a format may introduce the student to basic laboratory skills, it does not encourage developing a scientific approach to solving a particular problem. To address this pitfall, we have developed a curriculum based on three 3-week long modules with an emphasis on guided inquiry-based learning. This workshop will encompass portions of one 3-week module. An open discussion about incorporating scientific literature and student’s original synthetic design into an introductory laboratory course. The discussion will have a focus on challenges undergraduates students have had in the past, potential ideas for the future, and the ability to expand the idea to other lab courses. PLEASE BRING A LAPTOP. Many research and teaching labs rely on USB data acquisition devices to collect voltage signals from instrumentation, but such devices can sometimes be cost-prohibitive in large quantities. In this session, you will learn how to build your own device from a few commercial electronic parts including an Arduino Uno. Open-source software has been developed to control the device and participants will have an opportunity to use it with the constructed devices to collect a generated voltage signal. An interactive session to learn the basic Mathematica syntax needed to design a dynamic Mathematica Demo, as seen at Demonstrations.Wolfram.com. In this session, you will work to develop a basic Mathematica Demo. Once completed, you will work to add elements of your own to the demonstration. The tutorial that you will be completing is a shortened version of the tutorial actually offered in the Chem260H studio course. To see some examples of Demonstrations developed by the students involved in this project, go to: http://umich.edu/~pchem/compute-to-learn.html. This session is meant to help you develop the tools needed to begin coding in Mathematica, so no previous coding experience is required! Professor Carolyn Anderson from Calvin College gave a seminar for CSEI|UM where she addressed the intricacies of education at PUIs. See the full report here. 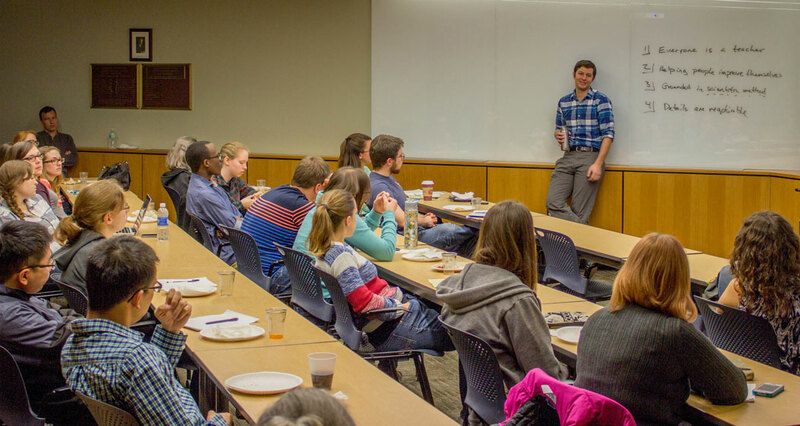 Representatives from the LSA Science Learning Center and the Sweetland Writing Center described their respective units and offered up options for how graduate students might engage with the SLC and the SWC on FFGSI projects. Guest Professor Tim Clark (University of San Diego, center) was joined by U-M Professors Brent Martin (l) and Nate Szymczak (r). 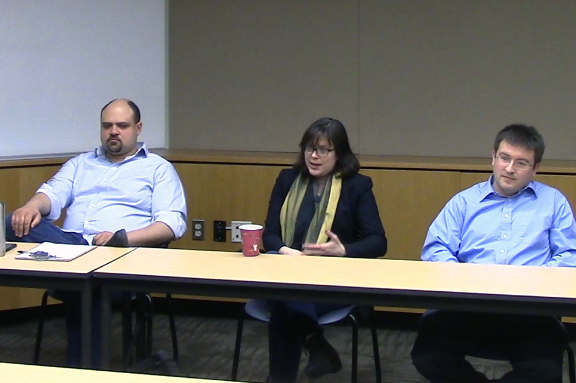 The goal of the panel was to provide advice for hiring post-docs in various settings. Picture this: you’ve landed your dream job at a large research university, and need a post-doc to jump start your research. How do you attract post docs to your lab when you are a new name? Or you’re at a primarily undergraduate institution and you’d like to have a post-doc in your lab to help mentor students and advance the science. How does a post-doc position at a PUI work and how do you get candidates interested? See the full report here. 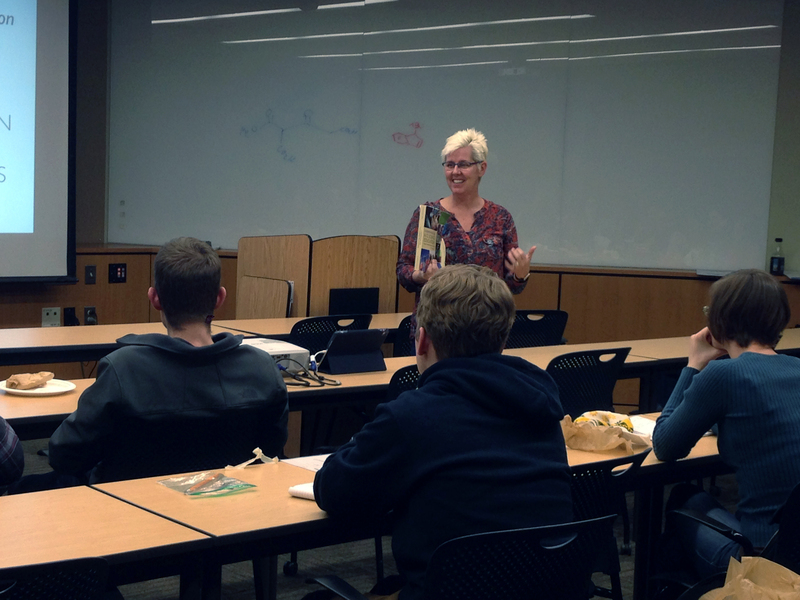 On Friday, December 11th, CSIE|UM welcomed Professor Joanne Smieja from Gonzaga University for a discussion on the effects of “flipped” instruction vs. traditional “unflipped” instruction on students’ performance in the first semester General Chemistry course. Professor Smieja created two general chemistry sections in the Fall of 2014, one taught using the traditional lecture instruction and one taught using a “flipped” style instruction. 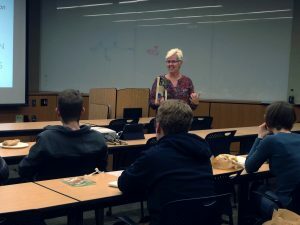 During the semester Professor Smieja collected data to determine if the class structure affected her students performance in the class. Her talk, entitled “Traditional versus inverted delivery of general chemistry content: Does it make a difference?” discussed her results from this study. See the full report and video here. 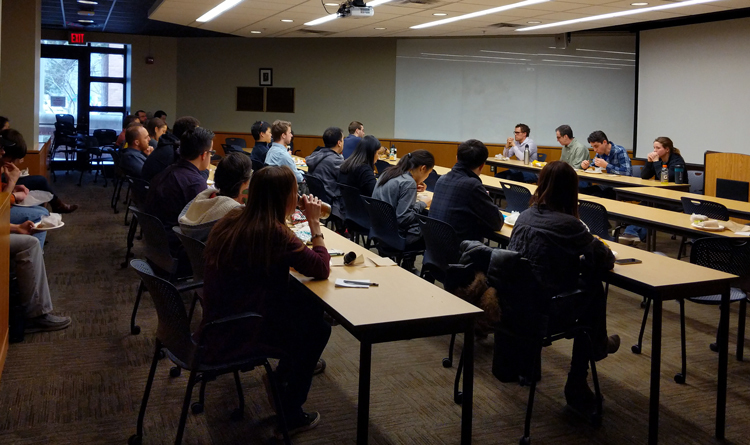 On Friday, December 4, 2015 we heard from some of our future faculty graduate student instructors (FFGSIs). These individuals took advantage of the opportunity to use half of their teaching appointment to work on an education-related project with a faculty advisor. Jieming Li presented her work with the Single-Molecular Analysis Research Laboratory (SMART) to develop a research program for undergraduate students. Alicia Welden and Kyle Williams presented their Compute-to-Learn project from the CHEM 260 Honors Studio. 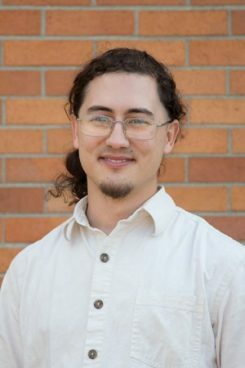 Jacob Lutter presented the work he did with Ginger Shultz to investigate the pedagogical content knowledge (PCK) of our organic chemistry lab GSIs. Nate May presented his work in the general chemistry lab sections doing authentic research with snow chemistry. 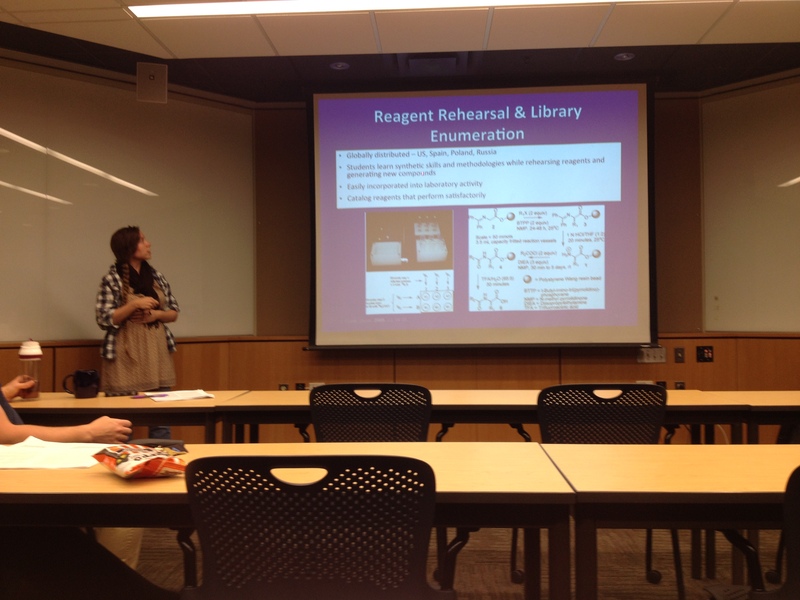 Jessica Rabuck-Gibbons presented her work developing special labs for the biomedical analytical chemistry lab course. A more detailed report, and a video, can be found here. Professor Gautam Kaul is part of the U-M leadership team for the DEI (Digital Education & Innovation). In his lively and candid seminar, he emphasized that universities are stressed to provide education to students while they are losing their governmental support. Because of this, universities have had to increase tuition, which ultimately threatens students access to higher education. While the US universities are losing funding, global universities are emerging and do not require or have an investment in physical space similar to the US universities. Dr. Kaul outlined the real challenge: universities have to work hard to provide the high quality of their education at lower costs than what is being provided now. 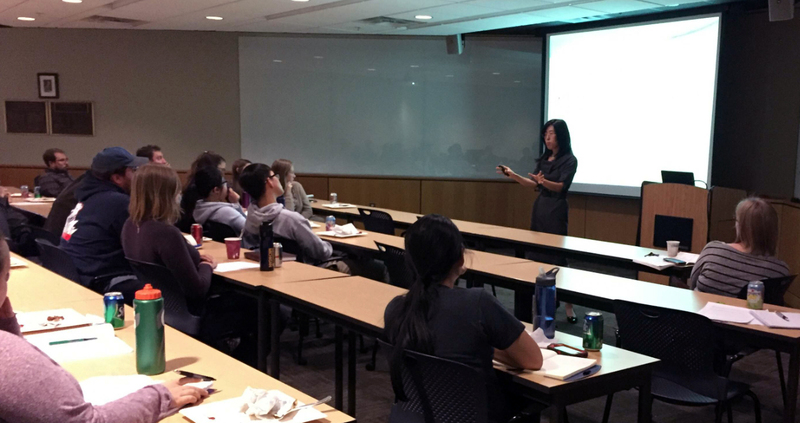 Nov 13, 2015 Seminar: Undergraduate Research in a PUI Setting Professor Sunghee Lee (Iona College) gave an outstanding talk on mentoring undergraduate research at a PUI. Dr. Lee has built an extensive undergraduate research program, and her group is currently composed of 13 undergraduate members who range from freshman to seniors. 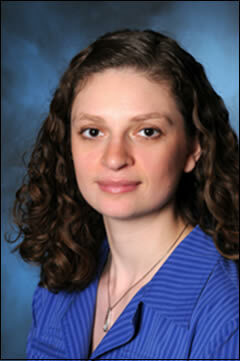 She has won numerous awards and grants for her research and her mentoring and teaching. Her talk, entitled “Project Symphony: Bringing Undergraduate Research to a Crescendo”, discussed important themes in running a successful undergraduate research lab. A detailed report, and the video, can be found here. This Fall CSIE|UM introduced the Pedagogical Demonstration, where education experts are invited to showcase exciting and innovative teaching methods for the classroom. The theme for this Falls Demo was on applied technology in the classroom, and CSIE|UM had the pleasure of hosting two experts in this area: Professor Resa Kelly, from San Jose State University, on the use of animations and other visualizations in the classroom, and Professor Barry Fishman from the University of Michigan, who has developed “gradecraft,” a gaming-based platform for managing a multi-item contract grading format in large classroom settings. A detailed report, and the video, can be found here. 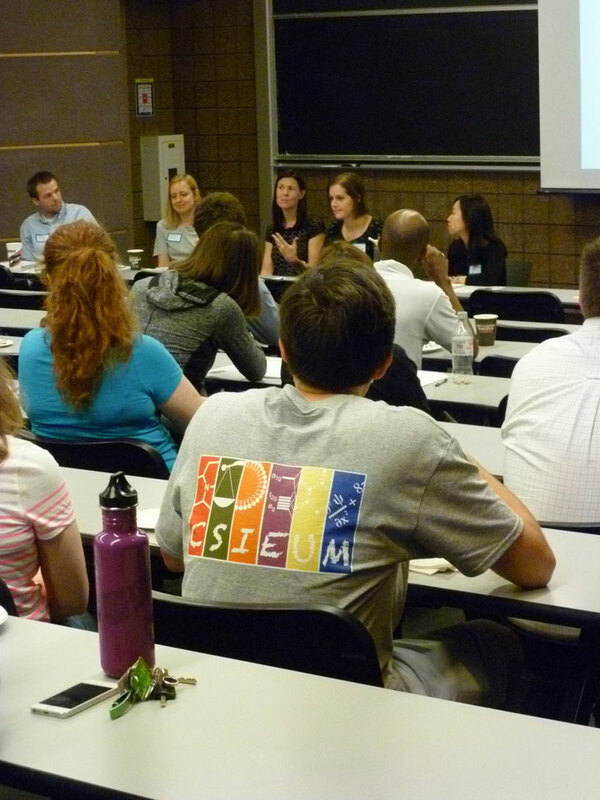 The inaugural CSIE|UM Symposium was held on Friday, June 19, 2015. This event, as are the rest of our activities, was designed, organized, and carried out by the CSIE|UM organizing committee. The theme for the day revolved around the challenges for teaching undergraduate laboratory courses. A detailed report about the day’s events can be found under the News entry for June 19, 2015. 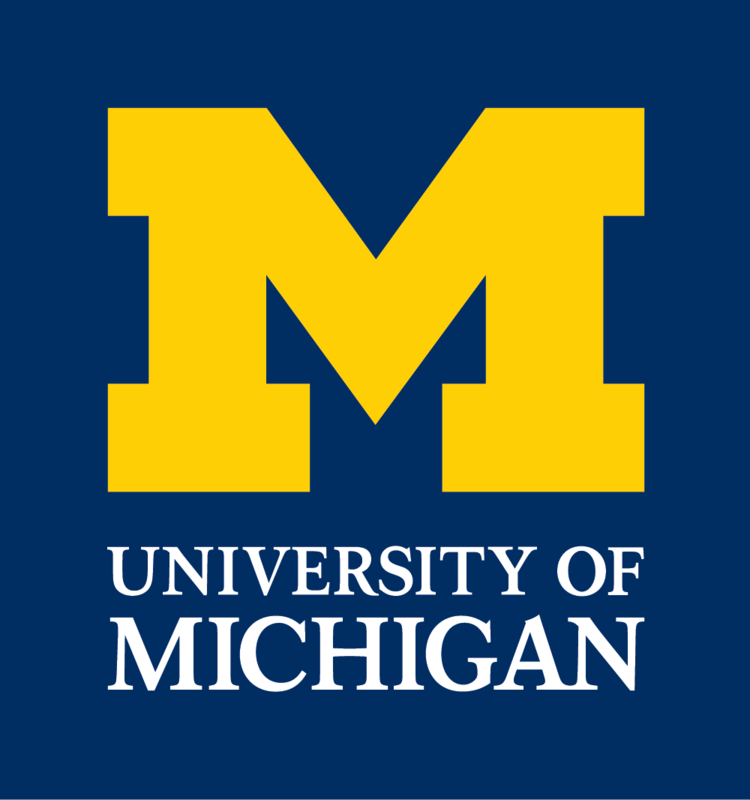 CSIE|UM is a program in the University of Michigan’s department of chemistry in which chemistry students who are interested in academic careers, undergraduate through post-doctoral associates, can work on projects involving instructional development, implementation, and/or assessment. These projects are led by the faculty and imbedded in the instructional program in the department, which creates a mechanism and a culture for sustained and iterative improvement within the teaching program. The CSIE|UM Symposium is an annual opportunity to present and engage chemistry education projects. The goals for this symposium are two-fold, (1) exposure of ongoing chemistry education projects, both locally and regionally, and (2) to provide a feedback loop between project designers and the broader community. For our inaugural symposium we have chosen to highlight the recent revisions on our undergraduate laboratory courses for break-out sessions in the afternoon. Register to participate in a hands-on laboratory experience. If you are registering to present a poster over the lunch hour, please be prepared to submit a poster title and list of author names when you register. 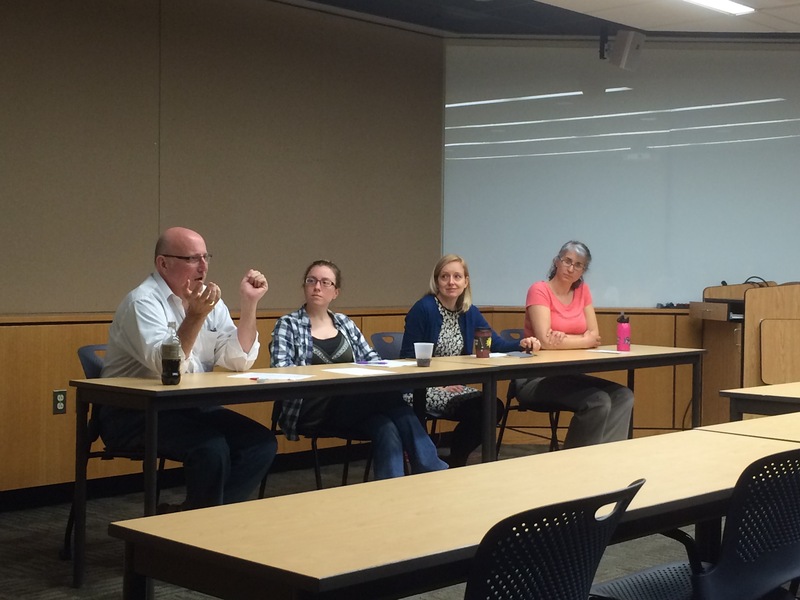 April 17, 2015 Panel: What is Honors? 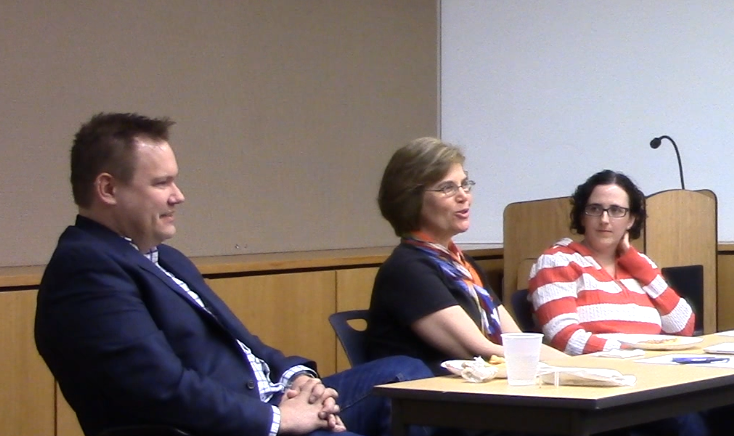 Professor Brian Coppola, Dr. Heidi Henrickson, Dr. Ginger Shultz, and Dr. Amy Gottfried served as the panelists. 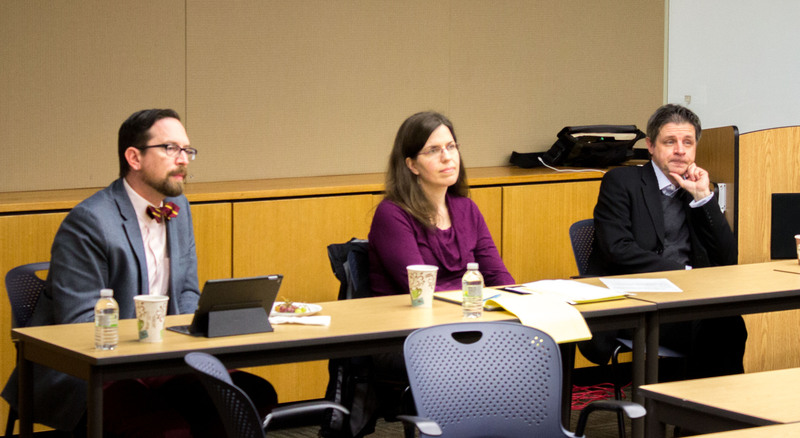 Panelists agreed that the purpose of Honors was to broaden and deepen the students’ undergraduate experience in the discipline, in whatever way that made sense for the course, the instructor, and the department. Different models for earning Honors credit exist, including supplemental instruction, specially designated course sections, and “Honors” conversions for individual students. For more information about this session, please see the News entry for April 17, 2015. Professor Teaster Baird from San Francisco State University (SFSU) for a series of discussions on inclusive teaching and a seminar of his current work. 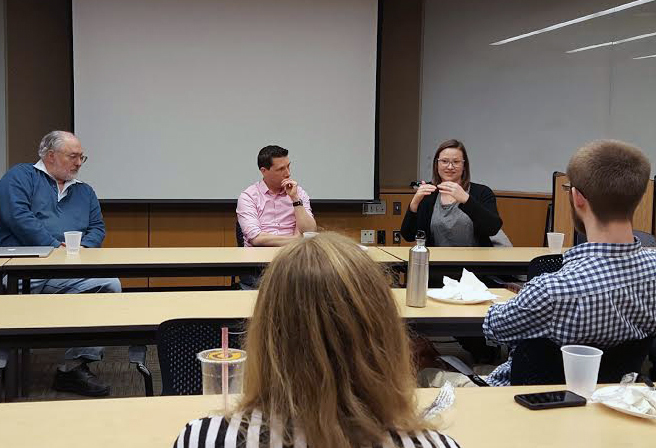 To start the day, Professor Baird met with several CSIE|UM graduate students and post-doctoral fellows for an informal breakfast to get to know the students and answer any questions they had. Over lunch, Professor Baird held an open discussion with graduate students, post-doctoral fellows, and faculty members on inclusive teaching. Professor Baird finished off his day at Michigan with a seminar titled, “Proteases & Pedagogy: Intentionally Blurring the Lines of Teaching and Research.” A common theme throughout his talk… and throughout the day… was the blurring of teaching and research and working to strengthen students’ scientific identities. For more information, please see the News entry for April 16, 2015. PART ONE: “Getting on the short list” Professor Alan Kiste (Cal Poly-SLO), Professor Stacey Bucannan (Henry Ford Community College), and Professor Neil Marsh (U-M) led a panel on strategies for making your application package stand out. PART TWO: “Preparing for the interview” Professor Stacey Bucannan (Henry Ford Community College), Professor Alan Kiste (Cal Poly-SLO), and Professor Mark Banaszak-Holl (U-M) led a panel on how to prepare for the interview process itself. 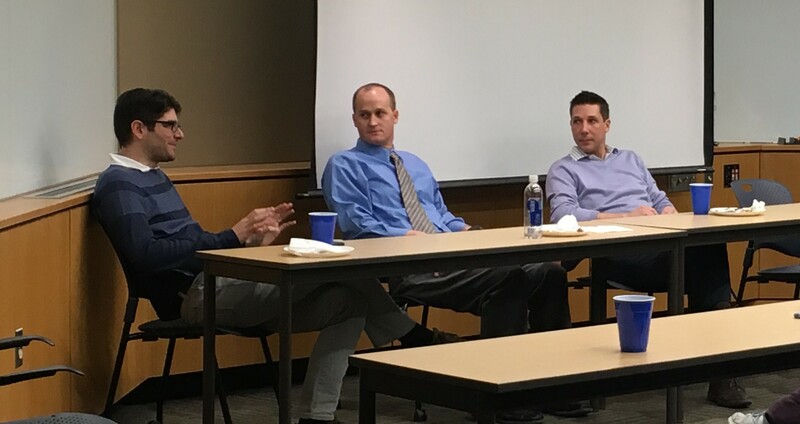 PART THREE: “Speed Interviews” Professor Stacey Bucannan (Henry Ford Community College), Professor Alan Kiste (Cal Poly-SLO), and Professor Bart Bartlett (U-M) led a novel interactive session for senior graduate students and postdocs interested in interviewing for academic positions. More details and discussion about these sessions can be found here, in the News from April 3, 2015. Professor Alan Kiste (Cal Poly-SLO) provided a Wednesday afternoon seminar on his assessment work with the integrated lab/lecture/discussion (“studio” format) for general chemistry at his institution. Caly Poly has been a national pioneer in this instructional strategy. 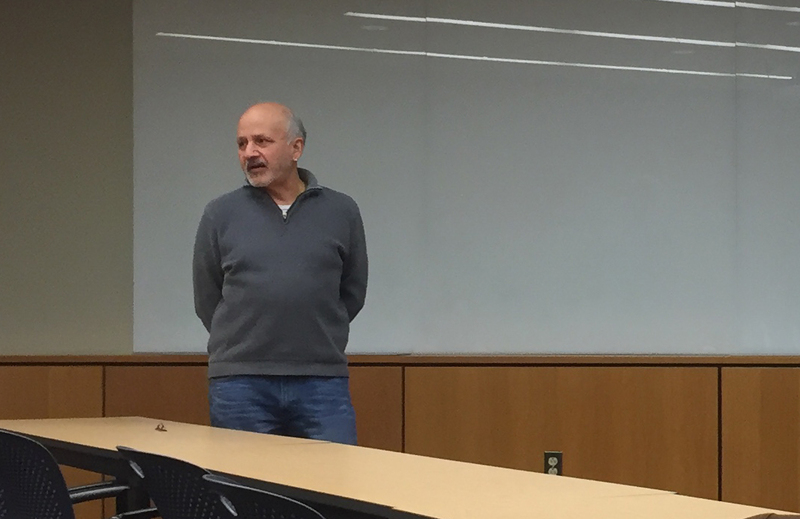 Professor Alan Kiste (Cal Poly – SLO) led an important discussion for graduate students and postdocs thinking about the academic interview process. The process can be difficult to navigate, even more so if there are other personal concerns such as finding affordable housing in expensive markets or finding job opportunities for a significant other. LGBT job candidates may have additional concerns about sexual orientation and gender identity issues and the role they play during the interview process. The focus of this discussion centered around how to address the “Illegal” interview questions that you may be personally invested in, such as considerations for a trailing spouse or assessing the climate of a department toward the LGBT community. More details and discussion about these sessions can be found here, in the News from April 1, 2015. 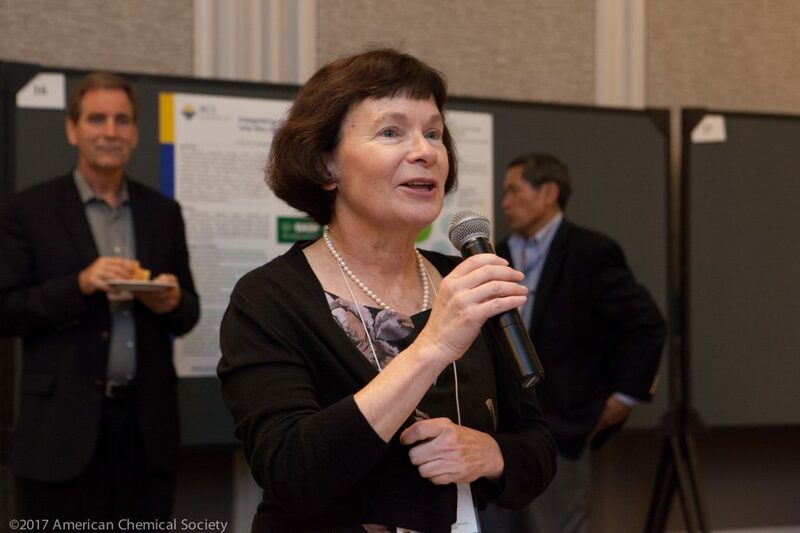 Professor Samuel Pazicni (University of New Hampshire), Professor Joanne Stewart (Hope College), and Professor Anne McNeil (University of Michigan) lead a discussion surrounding the balance of maintaining research projects in both Chemistry and Chemistry Education. Throughout the discussion, one persistent thread was the difficulty and importance of maintaining a supportive community. Research, regardless of discipline, is not done in isolation. When confronted with challenges in research or at the institution, each panelist described the importance of personal relationships that served as a safe place to seek help and support. See News from March 13, 2015 for more information. 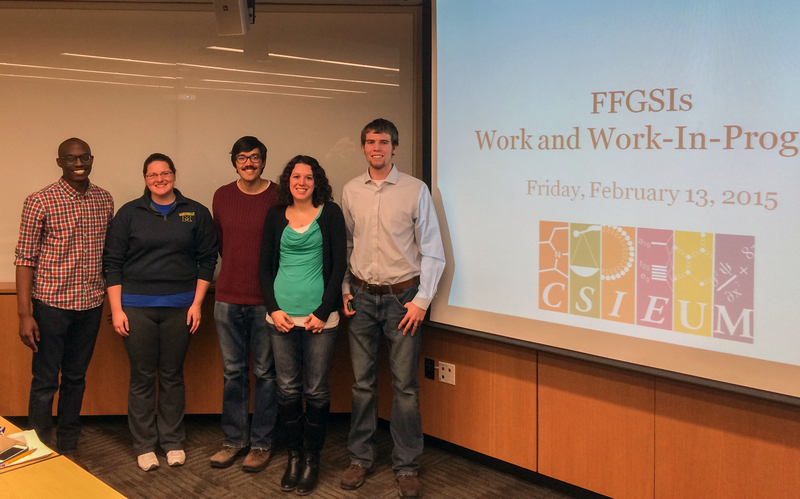 Five of the Fall 2014 Future Faculty GSIs presented on their education work to a standing-room only crowd. See: News from February 13 for more information. Danielle Zurcher talked about her work developing an online resource for CHEM 215 (orgo II) students using student-generated instructional material. Luke Peterson shared about his research design to capture GSIs’ experiences of and preparation to teach in our undergraduate courses. Casey Dougherty shared about her work incorporating biomedical and biological applications in CHEM 125/6 (general chemistry laboratory). Matt Beyersdorf talked about his work with the team redesigning CHEM 211 (orgo I lab) into a modular, hypothesis-driven labs. Kevin Ileka shared his work in incorporating microfluidics into CHEM 242 (analytical lab). Panel moderator Cassie Joiner welcomed (l to r) Professor Tim McKay (U-M Physics), Jill Halpern (U-M Mathematics, Comprehensive Studies Program), and Professor William Gehring (U-M Psychology), to lead a discussion about the institutional challenges related to working with underprepared or “at-risk” students. See: NEWS for January 30 for more information and a short video from the session. Dr. Andrew Feig (Wayne State University) shared his experiences in managing a portfolio of teaching, research, and service in faculty positions. 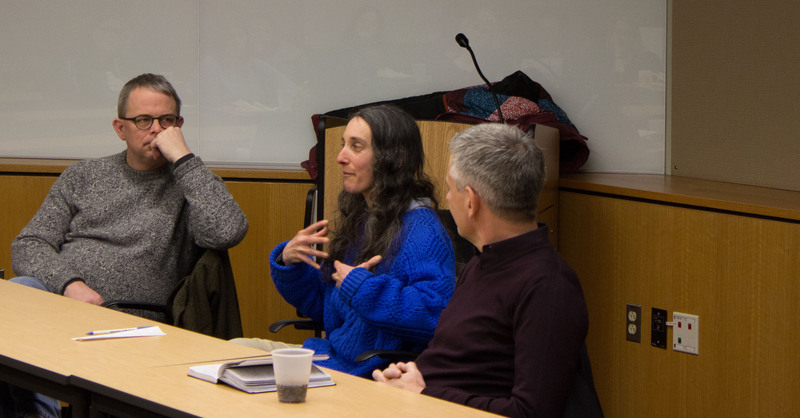 Through several vignettes, Prof. Feig used the seminar to highlight his entire portfolio and made the argument that more seminars ought to include and represent a broader array of faculty work than “merely” one’s laboratory research activity. See: NEWS for November 21 for more information. Prof. Andrew Feig (Wayne State University), Prof. Evan Trivedi (Oakland University), and Prof. Dominika Zgid (University of Michigan) to lead a panel discussion on their experiences starting a research group. Transitions from a post-doctoral appointment to a faculty appointment and the institutional contexts which they entered shaped their experiences in significant ways. See: NEWS for November 21 for more information. 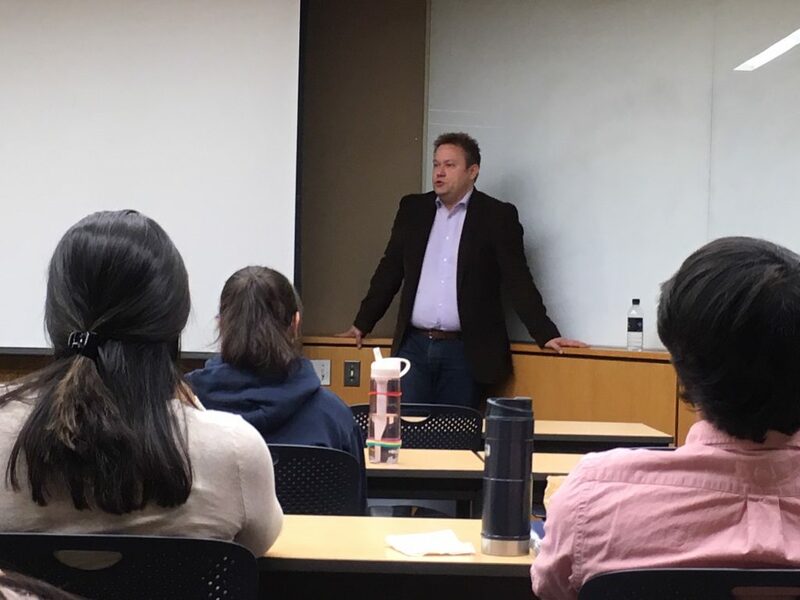 Dr. Alex Poniatowski (U-M) led a discussion on the philosophical and practical thought processes going into redesigning the general chemistry laboratory CHEM 125/126 at U-M. The course, which has a high enrollment of first-year students, is potentially the only laboratory course students take with the department. Alex thinks about these 4 principles: everyone is a teacher and students are encouraged to be collaborative, the course should help people improve themselves, the experiments should be grounded in the scientific method, and the fine details of the course are negotiable. See: NEWS for November 7 for more information. 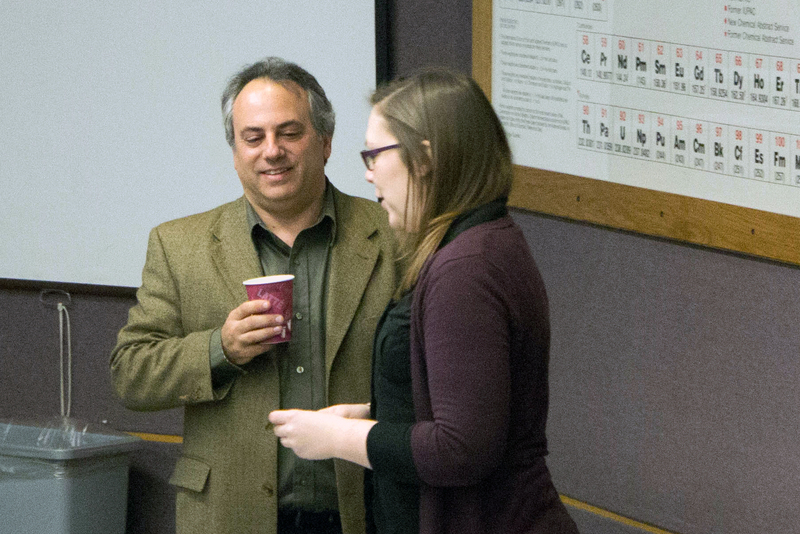 Three presenters (Heidi Philips, Andrew Molina, and Dr. M Taylor Haynes) discussed three literature papers on the topic of carrying out real research in undergraduate laboratory classes. Two of the papers discussed gave examples of doing collaborative research in upper level undergraduate laboratories. The third paper analyzed the impact that doing real research had on students 2-3 years after they had taken the course. See: NEWS for October 24 for more information.